Fuerza Regia outgunned La Union to victoriously open their Group E campaign. Six players scored in double figures for the Mexican team. Jeleel Akindele (216-C-83, college: Chicago St., agency: BeoBasket) provided 19 points, 7 assists and 6 boards for Fuerza Regia. The Mexican team piled up a 47:36 halftime advantage. They unloaded 46 points in the second half to ice the victory. Andy Panko (203-F-77, college: Lebanon Valley, agency: BeoBasket) provided 17 points for the winners. Torin Francis (210-C-83, college: Notre Dame) responded with 19 points and 9 boards for La Union. 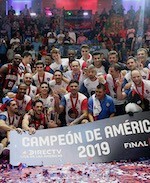 Guaros nipped Soles to earn the first victory in Liga Americas Group E. Six players scored in double digits for the Venezuelan team. Heissler Guillent (186-PG-86) delivered 18 points and 7 assists for the winners. Soles clinched a 47:44 halftime lead. However Guaros went on a 31:18 run in the third period to jump to a 10-point lead. Soles narrowed the deficit in the final stanza but could not avoid the defeat. Zach Graham (198-G-89, college: Mississippi, agency: Pro Sports) tossed in 17 points in the victory. Justin Keenan (202-F/C-88, college: Ferris St.) responded with 21 points, 8 rebounds and 4 assists for Soles.